Lower back pain sufferers might be familiar with the radiating pain in the buttocks or down the leg, commonly known as sciatica. For a rare group of people, the cause of their sciatica may not be coming from the lower back, but from a small muscle deep in the buttocks. Piriformis syndrome is the name given to the condition when sciatica is caused due to the piriformis muscle pressing or irritating the sciatic nerve. The piriformis muscle is a small muscle located deep in the buttocks, below the big gluteus muscle. It is attached to the spine and the top of the hip bone and is responsible for hip rotation. The sciatic nerve runs right below the piriformis muscle and when the piriformis is irritated or spasms, it compresses the sciatic nerve and causes pain, numbness or tingling in the buttocks and down the leg. As with most muscles injuries, piriformis syndrome is often caused by overuse or trauma. It is most commonly found among athletes, especially runners and cyclists. Exercises like squats and lunges may also be the cause for this condition. In rare cases, a muscle imbalance in the pelvis might be the cause and it is important that the patient seek the advice of a specialist to correct the imbalance to avoid reoccurrence of the condition. The most common symptom is a pain deep in the buttocks with little or no back pain. If the sciatic nerve is compressed or irritated, pain may be felt down the back of the leg, especially the hamstring and on occasion in the calves. The pain is aggravated by prolonged sitting, walking up a flight of stairs and hip rotation. Piriformis syndrome is a very difficult condition to diagnose as the symptoms are almost identical to most common back problems. As sciatica can be caused by numerous factors, such as herniated discs or sacro-illiac joint disfunction, the piriformis is quite often the last cause being considered when it comes to diagnosing. Unfortunately, a patient needs to through all the x-rays, MRI’s and scans to rule out any back injuries before a health care professional start testing for piriformis syndrome. Certain muscle testing can diagnose piriformis syndrome, but an MRI is usually necessary to confirm the diagnosis. In most cases, piriformis syndrome can quite successfully be treated with physiotherapy. A series of anti-inflammatory medication may be prescribed along with the physiotherapy. The practitioner will use various techniques, including stretching, massage, manipulation and electrotherapy to treat the condition. The main focus will also be to determine the cause of the condition in an attempt to correct it and avoid the condition reoccurring. The patient might be asked to stop any sport or exercise to give the muscle time to rest and recover. Once the patient is symptom free, a gradual build-up of exercise can be reintroduced. If piriformis syndrome is not diagnosed quickly and the pain becomes chronic, a health care provider may give a corticosteroid injection at the point where the muscle intersects with the sciatic nerve. This injection will usually decrease the pain in order for the patient to continue with the physical therapy. Alternative therapies such as massage, reflexology and acupuncture can increase blood flow and bring short term pain relief. In recent years, the use of botox has been introduced in treating chronic pain due to piriformis syndrome. The botox effectively numbs the piriformis muscle allowing the patient to continue with physical therapy with less or no pain. As the botox will leave the patient pain free, it is important to continue with the physical therapy as the condition is not cured. The botox only numbs the muscle’s pain receptors, not cure it, therefore continued stretching and conditioning is still necessary in order to experience long term relief. The patient should discuss the use of botox for this treatment with his/her practitioner and educate themselves in the advantages and dangers of the use of botox. In the unlikely event that conservative therapies do not bring the patient any relief, a surgical intervention will be needed. Luckily in this day and age the scarring is minimum and the recovery period only a few weeks. Patience is key when it comes to treating piriformis syndrome as in chronic cases it may take months to be completely symptom free. 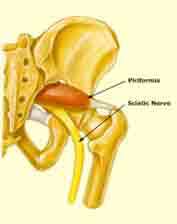 If you have suffered from chronic sciatica without a cure, mention piriformis syndrome to your doctor. It might just be the diagnosis that can put an end to your debilitating pain.